Sometimes, even with the best of intentions, a good thing does not turn out quite how you want it to…for evidence, enter COBBLER in the Instant Pot. When I prepare for one of our Quick and Carry Kitchen shows that we do LIVE on Facebook every Friday at noon, I study lots of different recipes. I take into account how the dish is prepared in a conventional way, and I consider everything I have learned about cooking in the Instant Pot over the last couple of years, plus, my training as a pastry chef. I am always skeptical of “baking” in a pressure cooker. I went to a farm market and got the peaches the night before the show. They also had really nice looking blueberries so, I had to buy a box and use them in the cobbler, now a Peach-A-Berry. I did follow the recipe exactly for the crust, and when I took the lid off after releasing the pressure from the first time I made it, I knew right then…this is NOT your average cobbler. 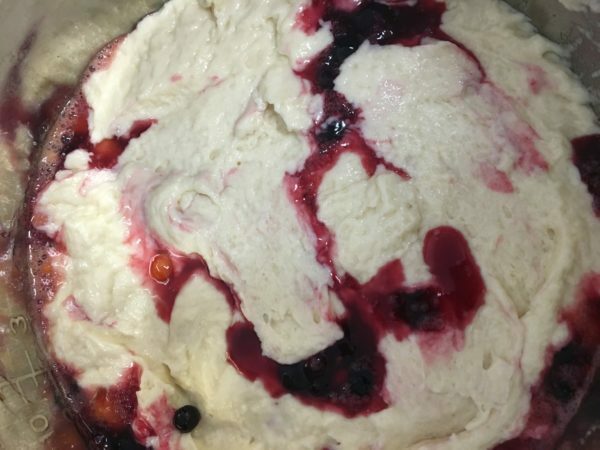 First of all, the filling, under pressure, comes way up over the dough…meaning that the dough is colored by the juices of the berries – so, no nice brown look. 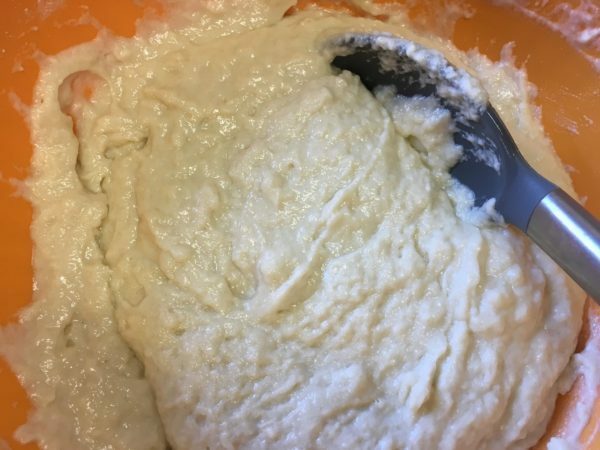 And, doughs that use flour in them typically turn out more thick and moist, almost pudding-like, and this is no exception. One of my eaters, who totally LOVED the delicious filling, would not eat much of the topping/crust because he said it was too much like a dumpling. He nailed it! That is what the weird texture is like, sort of like a real old-fashioned dumpling. The second time I made the recipe I added more flour and cornstarch to the filling to try to keep it a little thicker – it still cooked way up, hot and boiling, over the filling. So, this is just my gentle warning to you…even when Instant Pot themselves makes something that looks perfect? It might not be the exact same thing you get in your pot…and that is OK! There really are no failures in Instant Pot cooking, unless you burn it totally to blackened ash, which is hard in a moist environment! One of the best reasons to cook with an electric pressure cooker is this – even if it is ugly, it still tastes great! That is what to file this recipe under – Ugly but Delicious! 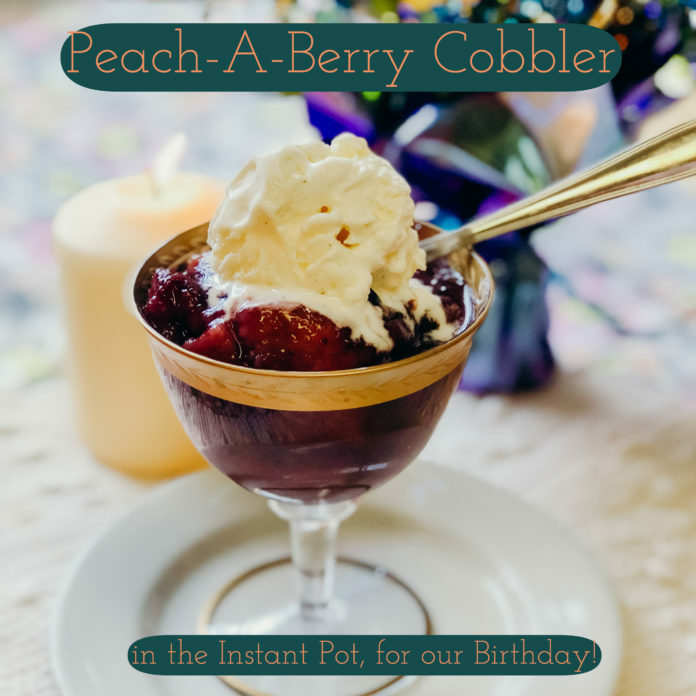 Join us as we make Instant pot Peach-A-Berry Cobbler! 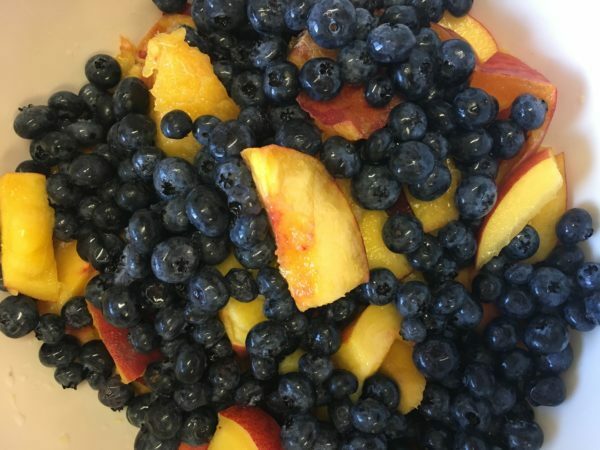 A delicious late summer dessert, using peaches and blueberries, made easy in the Instant Pot. Mix all the filling ingredients. 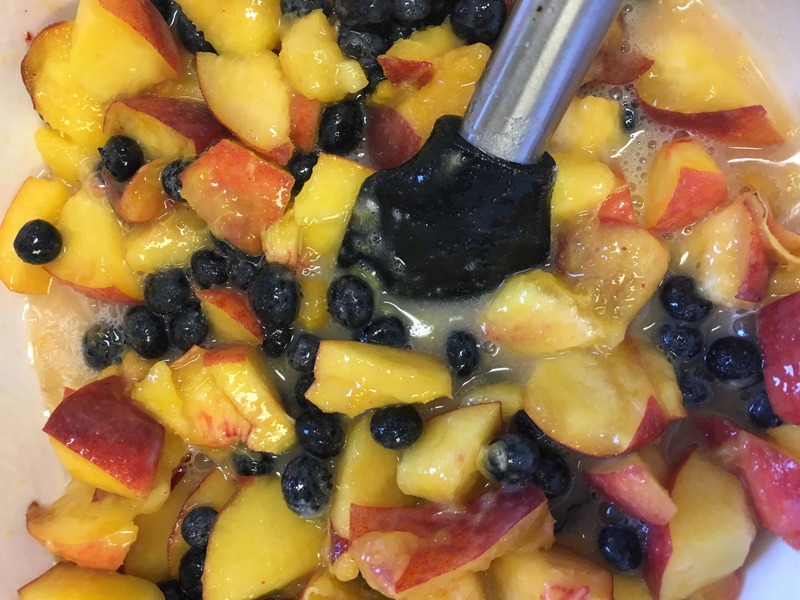 Turn the Instant Pot on to sauté and add fruit mixture and cook while you make the topping. Mix the dry ingredients of the topping together in a medium bowl. Melt the butter in a glass measuring cup in a microwave, and then add the buttermilk. Add to the dry ingredients and stir well. Turn off the Instant Pot. Drop the topping onto the hot filling - it will be free form and a little messy, and that is ok! Set manual/pressure cook for 20 minutes. When done cooking use a natural pressure release of at least ten minutes. Serve hot with ice cream.